This is supposed to be a baked potato soup but due to limited time, I boiled the potatoes. Other than that, I basically followed the instructions with a few minor modifications. I left the directions for baking, thinking it might be a more interesting recipe. Boiled potatoes worked out fine and we had a delicious soup. I admit, I am a big fan of potato soup and have not met one, I didn't like. Place flour in a large large pot; gradually add milk, stirring with a whisk until blended. Add mashed potatoes and 3/4 cup cheese, stirring until cheese melts. Stir in sour cream and 1/2 cup onions. Cook over low heat 10 minutes or until thoroughly heated. Ladle 1 1/2 cups soup into each bowl. Sprinkle each serving with 1 1/2 teaspoons cheese, 1 1/2 teaspoons onions, and a little chopped red bell pepper. Eat and enjoy. This is cold weather food since it warms both the body and soul. 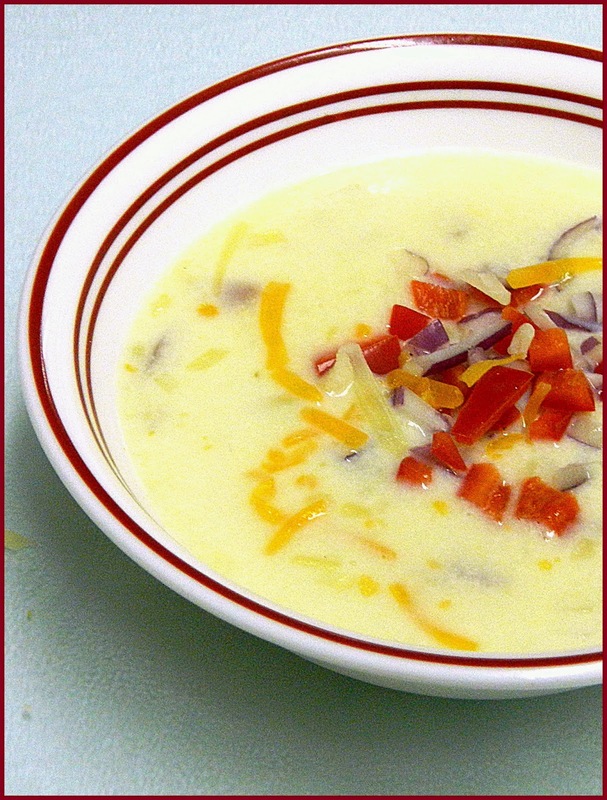 Delicious potato soup, thanks for sharing with Hearth and soul blog hop, pinning.